I’ve been running into a lot of people from my past. Not bad people, just people I thought I’d never see again. Okay, this isn’t entirely true. I knew I would see some of them again at some point. Today I ran into Joel P at Marissa’s graduation open house. Not huge suprise there, but it’s been a while since I’ve seen Joel (we figured about 9 years or so) and he’s now living in Michigan. Joel was one of my youth leaders at church back “in the day”. Karl Sjoberg also showed up. It’s probably only been a few years since I’ve seen Karl. 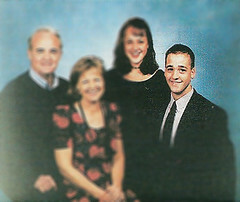 Again, he was one of my youth leaders at church (The Edge and The Rock [I think]). The big surprise came after the 5pm service. I went up and was talking with Jeff Aitken (again, another one of my youth leaders from the past…I though I see him every time I’m in Seattle usually) when this guy walks again, David. “David…David, he looks so familiar.” So I ask him. Sure enough, he was one of my old youth leaders from 10 or so years ago. David Voyles. He was in the Marines for a while, married, moved down to California. Now he’s out of the Marines, in the middle of law school, and interning up here in Seattle for the next few months. P.S. I scanned these photos in from the 1995 UPC Directory. I wonder how long it will take him to find this post?